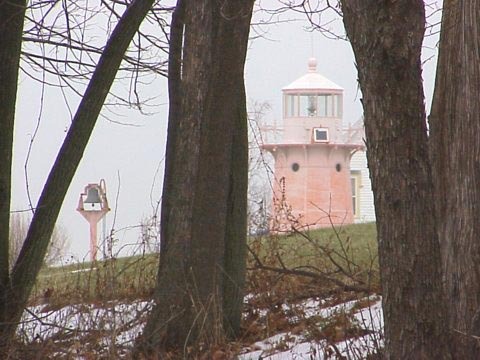 In 1857, the Lighthouse Board, at the instigation of local pilots, authorized a small light to replace a private one on the northwest point of Isle La Motte. Just south of this light the first European outpost on Lake Champlain had been established in 1666 by a french captain, Pierre de La Motte, at a fort near the site of the present day St. Anne's Shrine. The Board constructed a stone pyramid and placed an "ordinary lantern" on it, tended by a local farmer. However, the light proved to be unreliable on stormy nights, and in 1868 the Board recommended a small lighthouse to be erected in its place. By 1877 the Board found that increased traffic had made Isle La Motte one of the most important lights on the Lake Champlain waterway. Congress finally responded with an appropriation for a "watched" light station. The Board erected one of its new design cast iron towers fabricated of curved plates erected in two conical segments to a height of 24 feet and a detached white frame keeper's dwelling. The new fixed white light in a sixth order Fresnel lens was first exhibited in 1881, with its focal plane 46 feet above the lake surface, visible for 13 miles. A cast bronze fog bell was added to enhance the all-weather warning capability of this station. Newer technology and pressure to cut costs during the depression resulted in the erection of a steel skeletal tower in 1933, which is now solar powered. In 2001, the Coast Guard wanted to re-light some of the Lake Champlain lighthouses. Isle La Motte was one of the ones on their list. In 2002 the lighthouse was once again re-lit. From I-89 north in St. Albans, take exit 21. At the end of the ramp, take a left onto SR 78. Take SR 78 for 11.05 miles and turn left onto US 2. Stay on US 2 for 3.55 miles and turn right onto Summit Rd. In 1.4 miles you come to an intersection with SR 129. Turn right onto SR 129. In 1.54 miles turn right onto Shrine Rd. At the end of Shrine Rd. turn right onto a real small dirt road called Lighthouse Point. You can take this road for about 100 yards when you get to a point where the road/driveway is chained off. From there you can see the lighthouse through the trees. You can no doubt get better views from the water.